I would like to tell him one of these days I’m also chucking my cell, but not yet! He is not amused by my cavalier attitude and says one of these days an over-smart human species is going for a toss because we’re so unfit and ungrateful for the gift of life, etc. I’ve heard it all LIFE & LIVING before and keep hearing it more and more, but I’m sure good things are happening and may they happen faster from now onwards! That’s me on a waferthin note of hopeful wishing. To get back to the wondrous fruit called jak (enticingly, evocatively and seductively chakka pazham in Malayalam) it may interest fruit-lovers to know that this fruit is recognized as a multiple fruit. That means it comes with hundreds of flowers — it is the fleshy golden petals of these flowers that we eat. So fragrantly aromatic that after eating jackfruit one may be left inhaling one’s fingers even after washing of hands (it’s the same for the fruit of the durian). The jackfruit is related to figs, mulberries, and breadfruit, of the Moraceae family. I LEARNED more after junketing around at this year’s Ponsachem Fest. It‘s organised by niz Goenkars Marius Fernandes, Socorro Church’s parish priest Fr Santana Carvalho and associated villagers from Socorro. This festival was a real jackfruit gala with various jackfruit delicacies on exhibit to taste and tuck in — jackfruit chips, halva, jackfruit “papad” (like mango leather/papad) and I could have tasted more of the savoury jackfruit sabzi. It’s amazing how raw jackfruit with its mild taste can pass for meat in sabzi and cutlets. Some say you may cook it, herb it and layer it in a sandwich without anyone being the wiser. Pass it off as a fish tikka sandwich if you wish! The genial Mrs Sunetra Talaulikar (Home Scientist, ICAR Research Complex for Goa at Old Goa) generously told me to hang around for a herbal jackfruit coffee in a kotti. (Why don’t we make more use of these kottis and why can’t we buy them in the Panjim market for ecofriendly use?) The coffee mix was brewing away aromatically and soon I was sipping it gratefully (it was a rainy windy evening out there at the Socorro Church garden/orchard grounds). Mrs Talaulikar said, “You can make the mixture on your own using roasted dry powdered jackfruit seeds, roasted cumin and fenugreek seeds, and crushed cardamom pods in a 60:20:10 ratio. Store the dry choora mix and add a teaspoon of it to simmer in boiling water. Strain, and enjoy your jackfruit coffee!” Apparently, this coffee is a big hit in Chikmagalur district of Karnataka and the idea is catching fire. Thanks to some sterling folk jackfruit is being promoted in Karnataka and Kerala and so we learn that the jackfruit is really as much of a kalpavriksha (wish-fulling) tree of India as the coconut tree. The ripe fruit has many lovers and it’s also pureed and used in halva and payasam; the boiled jackfruit seeds make for delectable pass time nibbling (peel off slithery skin first); jackfruit seeds may also be turned into all-purpose flour. Actually a whole host of things can be creatively made courtesy the jackfruit tree (botanically Artocarpus heterophyllus)…there are several varieties but basically you’ve got the firmer, crisper golden fruit variety, or the pulpy, soft golden fruit variety which is difficult to eat and is better juiced with the golden sweet juice put to good use. Make sherbet, cake, and cupcakes. Out in South East Asia I remember eating jackfruit slices floating away gracefully like a drop of golden sunshine in an icy fragrant fruity dessert! Jackfruit marries well with coconut milk. Needless to say here that both unripe and ripe jackfruit has many culinary traditions in Goa and India. There’s a dish called gudeg, raw jackfruit curry, reddish in colour because of a teak leaf dropped in during the cooking process. It’s a speciality of Jogjakarta in Java (Indonesia). It’s popular in Kerala, Karnataka, Jharkhand, Orissa, West Bengal, Bangladesh (where jackfruit is national tree) and Sri Lanka. Google and you will find many jackfruit (ripe andunripe) recipes. 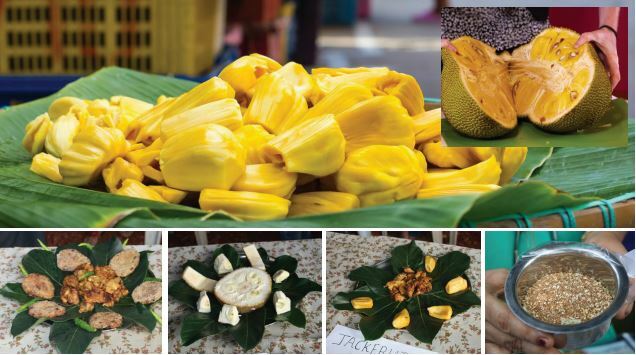 Closer to the truth is that all the jackfruit is going waste for young folk today are not inclined to work hard mastering the skills of harvesting the magnificent jackfruit, skinning and extracting the golden strands and pods layered section by section within. Cultivating and turning it into a potential business could very well be as welcome as money-spinning — if only someone with imagination and a go-getter’s spirit has a mind to swing it! There is so much to this mighty fruit. Discover it if you haven’t or discover it anew and anew…and anew. Bow down low with reverence for the jackfruit tree of India or Bharatdesh! Interestingly, the famous physician-naturalist Garcia de Orta in 1563 wrote about the jackfruit in his book Coloquios-dos simples e drogas da India. Some say the tree is named after Scottish botanist William Jack (1795- 1822) who spent his life as an East India Company servant adventuring in Bengal, Sumatra and Malaysia. Previous post: EK RAAT ISHWAR KE SAATH!